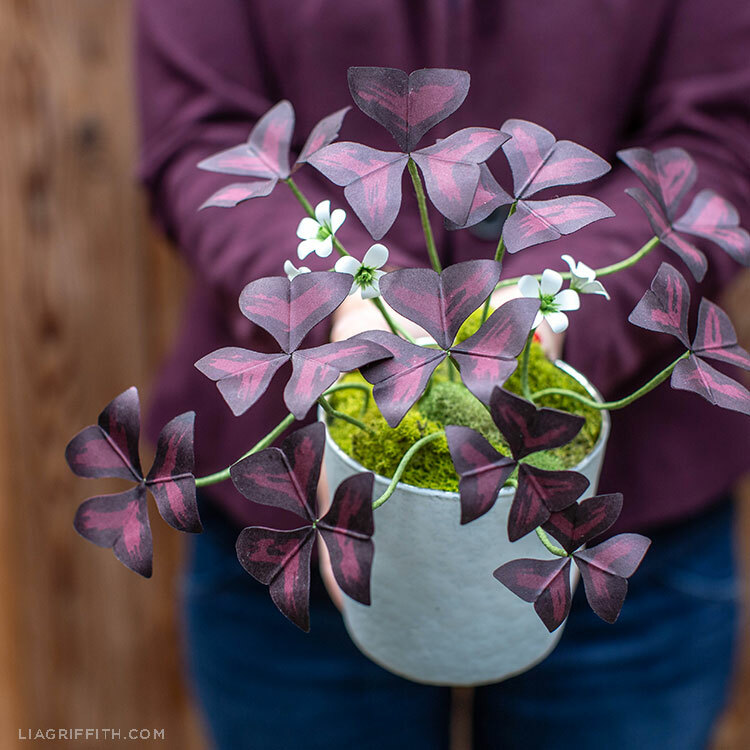 Today we’re showing you how to make this pretty paper oxalis plant, also known as the false shamrock, purple shamrock, and love plant. 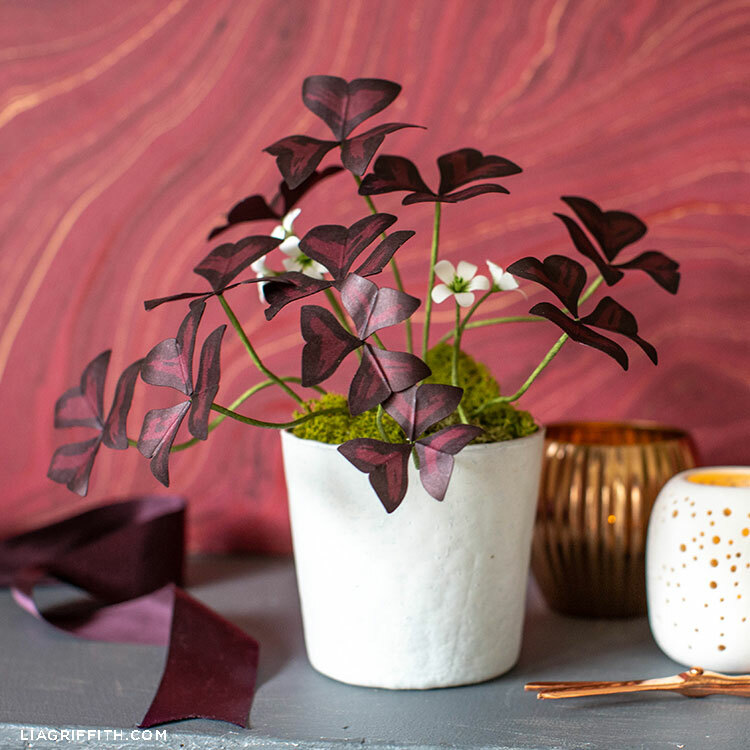 There are a few things that make the oxalis special and such a beautiful houseplant. One, it has three purple leaves on each stem that are triangular in shape. If that wasn’t striking enough, it also grows small white flowers above the foliage. Finally, its leaves open during the day and close at night! This along with its shape is why people think the leaves look like butterfly wings, fluttering up and down. 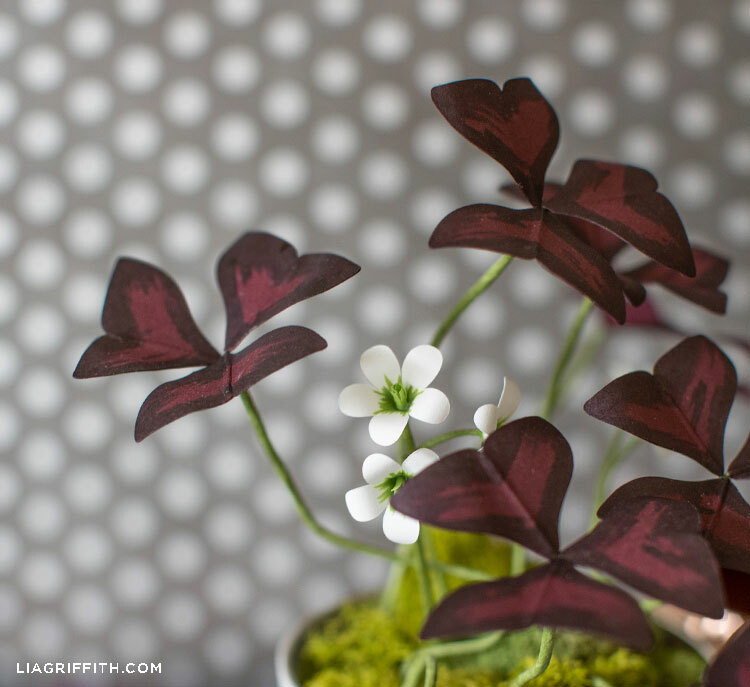 While there are a few different aspects of the purple shamrock to recreate in paper form, our pattern and tutorial below make this plant simple to craft. It’s also a great one to make for Valentine’s Day or for St. Patrick’s Day. Also, if you’re a plant lover, we have more paper plants on the site for you to peruse! We love to craft plants out of paper because they don’t require any maintenance. You don’t need to worry about how much sunlight they get or how much to water them. And they can last forever! 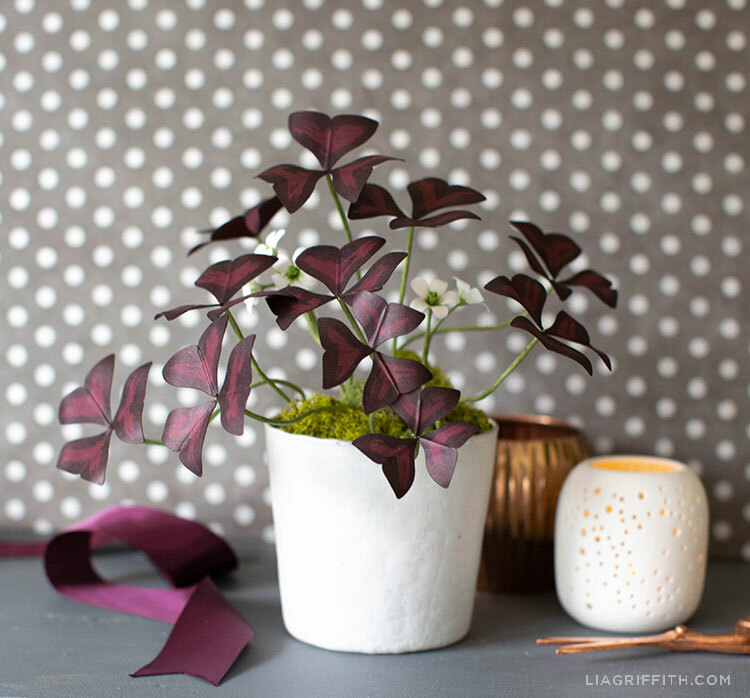 A paper oxalis plant will always be in season, as long as you want it to be. Another good reason to make a paper oxalis plant is because the real version is toxic to cats and dogs. That’s a big reason why we’ve created certain plants and flowers like the crocus, tiger lily, and ivy topiary out of paper. This way, you can enjoy them in your home and keep your pets safe! 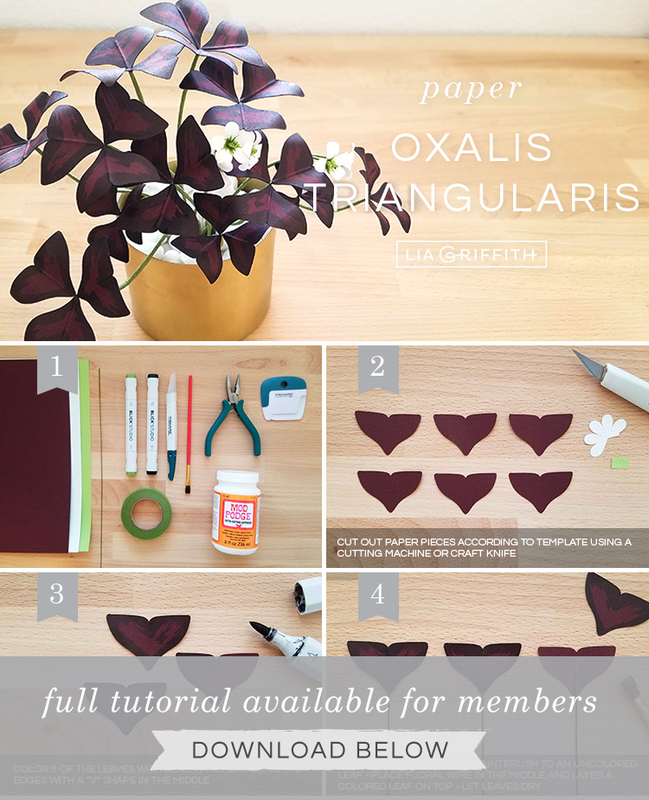 When you’re ready to craft this paper oxalis plant, you’ll need the tools and materials listed here as well as our pattern at the end of this post. We recommend using a cutting machine for this project. But if you’re cutting this plant by hand, you can download our PDF template below. Gather the craft tools and materials listed above. Then download the pattern at the end of this post. Cut out and score your paper pieces according to the template, using a cutting machine or craft knife. Color three of the oxalis leaves with a black art marker along the edges, leaving a “V” shape in the middle uncolored. Cut your 24-gauge floral wire in half. Apply Mod Podge with a paintbrush to an uncolored leaf piece. Place floral wire in the middle of the leaf and layer a colored leaf on top. Let the leaves dry. For more DIY ideas, browse our projects here on the site and be sure to follow us on Instagram, Facebook, and Pinterest. We also have more video tutorials to help you make paper flowers and plants, decorate with DIY décor, and more. To start crafting with us, sign up for a Lia Griffith membership.